I hope the mods don't mind me starting up a thread? I thought a thread for discussing and forecasting the impact of synoptic weather conditions, SST and the like on the Arctic sea ice would prove useful. This would be primarily for the short to medium term (few days to few weeks ahead). The Northern Hemisphere animation on meteociel gives a good overview of the patterns to be expected over the Arctic in the next week or so. The dipole looks like hanging on for even longer, and looks likely to give a near opposite pattern over the Artic for the first 2 weeks of March compared to last year. Because of this, I think we've reached our peak extent for the Bering Sea, but may continue to see some slow growth over the Greenland and Barents area during March and early April if the dipole pattern continues. No dramatic losses in extent/area for the next few weeks at least, unless the Bering sea ice takes an unexpected dive. Our policy is to destroy threads unless they're brilliant. Which is why this one is allowed. Looks like we'll be getting more direct measurements of ice thickness soon. NASA's IceBridge starts its Arctic 2013 season in less than 2 weeks. I seem to recall that last year their thickness measurement transects matched the thickness estimates from satellite sources. Anywho, the 00/06z models have changed little, other than to sure up a very strong cross polar flow, stretching from south of the Aleutian Islands, all the way into Europe at times, aided by a strong +ve dipole pattern. Further ahead, the 8-10 day 500hPa geopotential height charts suggests a continuation of the dipole pattern. Overall, likely to see slow gains in the Atlantic sector, with northely winds through Fram and into Barents, and cold air over Barents also. With the Bering sea, I'd expect some variability as storms pass through, but a general downward trend over the next week to 10 days as bouts of milder air and southerly winds take their toll. The sea of Okhotsk looks very cold throughout the next week though with mainly westerly winds blowing the ice away from shore, so that's one area that could see some significant gains. The current pattern splits the cold air, sending one lobe into Eurasia and another into North America. It's unlikely we'll see a return to the significantly below average temperature North of 80N again during this time. Your analyze is appreciated, thank you. I have even off-topic reason for that, being a hobbyst gardener I'm a bit worried by possible slap by Tale of Dying Winter Dragon. Yes, nice discussion Born form the Void. With area now 13.597 m km^2, 202k below the max 5 days ago, only 13 of 34 years have seen on increase of more than that from this date. With the weather staying fairly similar to last 5 days that have seen that 202k drop then a later max this year does now seem pretty unlikely. Other people have said this earlier than me so I am probably late arriving at this conclusion. The orientation of the dipole is also significant in that it has the potential to drive Pacific water in through Bering. The North Pacific may not be too warm, but things are comparative, it's warmer than the Arctic ocean under the ice. Crucially Pacific water is less saline than Atlantic so is more likely to interact with ice at the surface. Thanks for the work on the thread BFTV! I know your Studies must impact on time available so I'm doubly impressed at your efforts here. With the ice now starting to appear well broken over the Pacific side I'd imagine any swells, pushed in through the Straights, would make even more of a mess of the ice as they push on into the basin leaving a very weak area in front of the straight.....rinse and repeat. The weather appears to be conspiring to rob the ice of any structural strength well before we get into melt season proper? I suppose the other thing would be the mixing of any warmth at depth that wave action could bring up to the ice base? If the weather patterns of the past two weeks have caused a stall in CT SIA and IJIS SIE increases, the fact that the weather models are forecasting at least 5 more days of similar weather patterns, could very well mean - like crandles says - that the max is already behind us. This could be bad news for the Greenland Ice Sheet, because those waters on the west coast were 'hot' during the whole melting season. You can add the swirling currents of the Gulf Stream to that as far as I can tell -- more obvious in salinity than in surface temperature. The Labrador has finally pushed a hole on the western side, but the Gulf Stream seems to want to head north very badly. No worries, Ivica and Randles! ChrisReynolds, I think we'd need the dipole pattern to remain steadfast for a number of weeks before any there is any risk of Pacific waters entering in through the Bering strait. This is especially true while the sea ice coverage, albeit thin, is still quite extensive through the region. Cheers GW. A bit ill at the moment, so I'm only spending 8-10 hours/day on studying an assignments! If we do get a strong dipole pattern this summer, akin to 2007, I would suggest a sub 2 million minimum in September. The ice is much more vulnerable now compared to 2007, both from warm water and air influxes from the Pacific and export into the Atlantic. The difference in movement between the wedge of MY and the surrounding FY ice is stark, let alone the vulnerable state the FY ice has shown in the last 2 weeks. Neven, the westerlies in Okhotsk might increase the ice there over the coming days. Okhotsk really is the wild card with regard where the extent/area will go, as it could easily stick on a few 100k over the spae of a week or two. Otherwise, a good chance we've passed the peak, which would be a February maximum on both the CT and JAXA measures. I decided to begin a thread to track current weather and future forecasts to document weather change impacting the Arctice Sea ice. As mentioned on the Forum, and in the NSIDC reports, winter storms were one contributor to the current sea ice conditions. The upcoming change they forecast through March 14, is the movement of a SLP over the Arctic Basin, which will establish winds moving between the Bering and the Barents for a couple days, this pattern copies the current wind patterns in the Arctic. The result should be to move more ice toward the Atlantic. A4R, I merged your thread with this one as they are practically the same. Hope you don't mind. I think max extent and area will be reached, if what A4R just posted plays out. Not a problem, it was late for me, and I had not thought carefully before posting. If you look at the stream of AVHRR Ellesmere imagery, the westerly winds are blowing across the MYI north if Ellesmere, and the new storm - warm air, is streaming over the pole and this is expected to intensify through the week. Your URL above will not work without including a Username/password for that site, since it does not allow anonymous FTP. Three AVHRR images are posted below to counter the "meteor did it" argument for sea ice fracturing. There was no major change in the ice fracturing for five days after the meteor event, which seems to remove connectivity between meteor seismicity and Arctic ice breakup. Seems like the Arctic Ice fracturing has now reached Ellesmere Island's coast. See below. A4R, that is one eye-opening image I have to say... It seems that the structural integrity of the thickest of the MY Arctic sea ice is now in a perilous position, and may well become mobile. My amateur read on this is that only the ice within Lincoln Sea and inside the CAA are still somewhat "sound" (at least from the surface). But even those areas seem to reveal some fissures emerging when you zoom in on the image. The latest AVHRR image reveals further fracturing of the thickest Arctic ice, and the HYCOM/CICE forecast of seperation from Ellesmere seems to have begun playing out. Add to that what is coming in sea ice motion modeling, and we will be seeing these breaks widen in the near future. March 17 1747 - Latest - new fracturing sideline-highlighted in yellow along the coast, etc. March 22 - HYCOM/CICE ice motion forecast. Here's a blink pic for the most recent wide area of clear sky and the recent fracturing as seen in the latest IR from EnvCan. 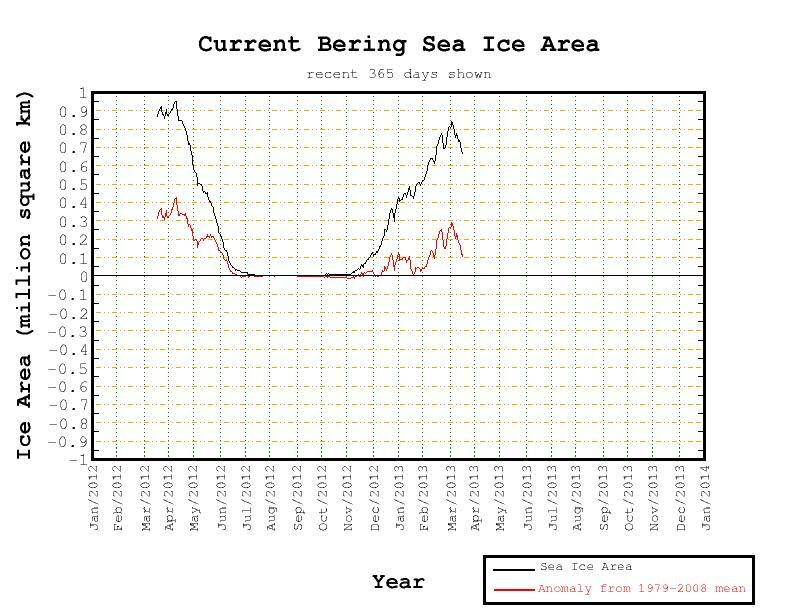 Has anyone noticed the huge drop of SIA in the Bering Sea? Isn't there a strong wind from the south happening in the Bering? That would compact things a lot. Have you noticed Barents and the Hycom forecast? Check out ice movement through Bering, it's being drawn into the Arctic Ocean. Not sure what you mean, I see continued movement into that region. Sure, I saw the movement. But I was still surprised when seeing that big drop. The area is already a lot higher than last year and HYCOM has the ice on the southern shore spreading out a lot. Yes there is continued movement into that region from the north as well as spreading from the south. Neven was pointing out Bering dropping and being 0.2m lower than last year. It seemed to me that Barents was up on last year by more 0.3m and was being forecast to go further. Nothing particularly insightful we know it is common for the other side of the pack to be doing the opposite. It is also more of a return to something more normal for both regions. If this continues, what will it mean for the Greenland Ice Sheet? Will we see videos of raging waters again? Thought it was time to re-highlight the latest fracture line - we are well over 1,500 miles long. Anyone seen this in the past? I am still using the word "unprecedented" for this given time of year, physical forces exerted on MYI, and the implications for movement and melt - the models aren't keeping up. HYCOM CICE modeled this fracturing 4-5 days in the future - not now. Also the OSU SLP/ST/Wind models forecast a low developing over the CAB by 032213 0000. We are in for an interesting - and perhaps foreboding - Spring in the Arctic. Neven, do you have the absolute temperatures to go along with those shocking anomalies? Is it actually melting now around Baffin Bay? A4R, am I seeing that right? Does that crack essentially cut off much of the thickest ice from the land? Some of these fractures reaches all the way from the coast of Ellesmere / Greenland to Franz Josef Land (Russia)? That's the anomaly, difference from baseline. NCEP/NCAR gives temperatures in Kelvin, that's the same increment as degC, but 0degC = 273K. So the very warm anomalies off Eastern Siberia and in Baffin Bay are due to warm tongues protruding into the climatological cold pool over the Arctic. These respectively are in turn associated with a high in the north Pacific off Bering, and a high over the Arctic Ocean north of Greenland. I am leaving a post for A-team - with a request. A-team, can you take an AVHRR image, clean up the clouds to reveal fracturing, then overlay a HYCOM CICE ice thickness image or vice versa? I need to depict how much fracturing is taking place in areas with ice more than 2+ meters thick. It is very important and will make a difference. Attached are two images, like I was considering. I do not have your skills and need them to do this. A-team here are the two closest corresponding Beaufort (031913 1156) and Ellesmere (031913 1156) that I have. They would match up with the NRL 031913 sea ice thickness run, that I posted above. If oyu haev a better solultion to reach this idea, I am open to it. Not sure if you realize that A-Team is not registered here as a member. It's probably best to leave your request over at the 'blog. Thanks Lodger, I was not aware. I did leave my request on the blog. We may have to connect another way. I'm seeing some stronger southern winds over the Kara Sea in days to come on the ECMWF forecast maps. I wonder if we'll see the ice react. Winds from the North would be even more interesting, as they blew the ice back from Novaya Zemlya fairly easily in the last two years. But no such winds this year and very low temperatures. I think I see what you mean,Neven. The outlook for NH spring remains extremely meridionally organised... spring flows and melting might have to wait until the warming sun bites into the North Siberian/Canadian snowbelt. Something like that will suddenly cut the cold flow into Central Europe too. I had a cursory look at the ECMWF weather forecast and noticed that another big dipole anomaly is setting up and a big cyclone is forecast to move over GB next week. SIA and SIE have stalled a bit, which is normal. But I'm curious to see what another big high over the central Arctic will bring in the next 5-10 days. The slowly moving high pressure area seems to have suddenly moved and intensified, travelling across the Arctic Ocean towards the Beaufort Sea. A complementary low pressure area appears to be developing over the Barents Sea. The Beaufort Blender (Gyre) is anticipated to change to fueling the Fram ice flow. The ice continues to fracture, and although it refreezes, the weakening seems to create a higher probability of faster melt. Melting on the Atlantic side is in full swing as well. Following intrusion of Atlantic water from north of Svalbard to north of Franz Joseph the ice is thinning. Any guesses on how long it will be before the northern route is open? With Pacific water hammering on the Bering and ES Seas and Atlantic water plowing a path past Svalbard and Franz Joseph.